For the past few days I’ve been exploring Google SketchUp Pro while working on my next set of free tiny house plans. I still have a bit of work to do but as you can see I’m making good progress. What I’ve found so far is that the free version of SketchUp will give you most of what you need; in fact I’m thinking that for non-professionals the free version is all we’ll ever need. I can see an architect making use of all the presentation features of the Pro version but for most things they are just overkill. The main reason I’m interested in taking this test drive through to completion is that I want to see how Layout, the 2D software bundled with Pro, integrates with the 3D drawings. When I’m done with this 3D rendering I’ll then get to see how easy it is to create the 2D drawings from the 3D drawing. In the mean time take a look and for those of you who have installed the free version of Google SketchUp on your computers download my working file and take a closer look. It’s a bit difficult to see without the movement. Update: These plans are complete. See our free tiny house plans. This entry was posted in Free Plans. Bookmark the permalink. Guys: I really enjoy looking at these neat, little, designs. But they are, for practical purposes, and as the world goes, both expensive in execution and impractical in the real world. They are zoned out of nearly everywhere. Unless you are already “land-rich”, where in ——- do you put one of the more exotic kits? Answer. Really they are toys. You can erect one behind a big house (maybe); or you can use one in the boonies where there are no restrictions. But for people who are looking for a practical alternative to contractor hell, something to actually live in within driving distance of work in suburban Philadelphia, I’m at square one, despite staring at designs for ten years. Most of these houses–these ones I happen to like, the funky ones–cannot be built anywhere near where I live. They are, withal, irony of ironies, a rich man’s indulgence. Is there no exit from this impasse? Tiny houses can be built but you are partially right, they do not fall into the category of ‘normal’ so it would be difficult to get things like traditional real estate financing or even a permit to build a single family dwelling but there are viable paths that are lower in cost to a ‘normal’ house. 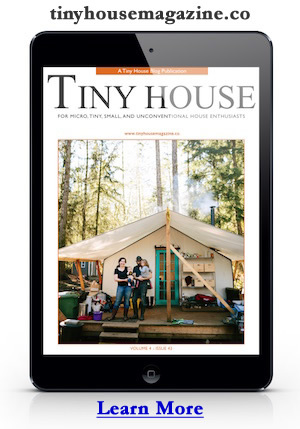 Also see this recent issue of Small Living Journal for some ideas on getting tiny houses built. It’s true that you have to find places that will accept a structure like this. I’m planning on building a house from Michael’s 8×16 plans and I already have picked out a location in an RV lot in Big Pine Key, Florida, where I can put it. And my answer is, because I don’t own my house when I rent. I don’t own the land in the RV lot, to be sure, but I will own my house. I can easily move it to another location without having to deal with the hassle of selling my house and buying another one. I can fully design the interior to my own desires, unlike buying a used RV or yacht. If I want a king sized bed, I can make the loft big enough to handle it. If I want to put my upright piano in the trailer, I can design around it. I can create the ability to seat 4 people for entertaining inside. I have clothes storage space equivalent to a modern one-bedroom apartment closet. I have a large flat screen tv for entertainment, and a computer desk that fits my laptop and printer perfectly. And more than anything else, I will own my house long before most of my peers who are anchored to a mortgage. I have freedom far beyond the suburban “let’s get the 3000 sq ft house and the Escalade and the 20 seat dining room table and the heated diving pool so we can impress the neighbors” mindset. Others may laugh; my best friend even implied that he’d never visit me at my future trailer because it would be too cramped for him. Yet he never once complained about being cramped when he would have company over in his cruise ship cabin, which was smaller than my house would be. Such is the backlash. There’s a backlash by some because we’re seen as doing this merely because we can’t afford anything else. The truth is, these houses cost more per square foot than many other houses. It’s very easy to build 4 walls and a roof. It’s harder to make that space inside usable and serviceable. Anything well designed costs, unless you design it yourself, and then it still costs in terms of sweat and time. The truth is we need far less space than we take up. I didn’t say we want far less space: we need far less space. The Japanese have a saying: a full mat to sleep, half a mat to stand. A mat is roughly 6×3, if I remember correctly. I wish to do it for the sake of liberty: in the United States, I don’t believe that I should be forced to sign my liveliness over to a monetary system, which in cahoots with big government and construction industry, say in what or how I may live; furthermore, when the prices of homes are arbitrarily created upon the whims of greedy financiers, to whom I will pay, likely, over double their arbitrarily-created price for money they never had to lend me in the first place. That’s my reasoning; that, and that I believe that this sort of system seems no different than slavery (though serfdom might be more appropriate), which is something history books talk of in the past-tense. My wife and I own a small farm and we have several addresses on the property. We are thinking of replacing an uninhabitable trailer with a “Tiny House” to rent out to a student. We’ve received several inquires about a space just big enough to sleep and cook in, so I know that there is a market for a small or very small house to rent. Yes, a “Tiny House” maybe more expensive per square foot to build, but it can be a lower total cost structure than say a 700 sq ft home. A small “conventional” home can cost more at 80 to 100 thousand dollars while a “Tiny House” could cost maybe between 25 thousand dollars and 50 thousand, less if you can find an old mobile home frame and build it yourself (of course this is dependent on how much material is repurposed and what level of finish one chooses). In answer to Stephan’s post, a tiny house is not for every one and maybe only for a few folks, but I think a tiny house has it’s place. I’m ready to invest 30 thousand or so in a very small house. In addition I am considering a 10 x 10 insulated shed for use as a pantry / storage and for a clothes washer, this may add enough space to make some folks a little more comfortable. This conversation on what is big enough brings to mind the folks that say Solar power in the North West is pointless. I have a 2.28 KW system and though I don’t rely totally on it I think it is worth it. One must approach what they use with what they have. If I only had 5 KW to use in a day, I’d better use less lighting and not leave the TV on all the time. Refrigeration, hot water and heat would be better served by a propane system freeing the free electrons to power a light ( read: Cree or Luxeon LED’s) and an energy efficient computer. For the person believing that they must have most rooms in a large house lit when it’s dark out side, as well as a TV, refrigerator, freezer and dryer going, solar will not work well. A person who wants a den, a dinning room, two bath rooms and a breakfast nook will not find a small house to their liking. Looks like my dream home. May I suggest that your stud spacing be 24″ on center? Granted, on this project it will only save you 7 studs. However, even if you are using the IRC as your guide, 2×4 studs at 24″ o.c. is acceptable. The old school builders will complain that this results in wavy walls. What really causes wavy walls is the laziness of not spacing your sheathing a nail shank’s width. I do QA for energy efficient building and time and time again I see the plywood and OSB butted right up to one another. Even with studs at 16″ o.c. there will be some noticeable ‘wave’ after a few seasons of expansion and contraction. Brian… this is great info. Thanks! Yes I think I will make that change. Would you have a sleeping loft on one end or the other? I wonder if it would it obstruct the dormers and interfere with solar gain in the rest of the house, while getting too hot in the loft. What about offsetting the dormers closer to one end or the other to make more room? I was actually going to leave the loft out of this one because I think the gable ends are too short. But the design should still allow for customizations like the ones you suggest. Very great design and its really FABULOUS! Great design! I have a small travel trailer. Just a small slide out makes a big difference in how big the space seems. A small slide out where the wall bed is located might be a good idea. What do you think? Bus101.com/slide_outs has some designs for small travel trailers. …..